Is it too early to say that we’ve made a turning point (for good) in the weather…finally?! It was so refreshing to not have to wear at least 3 layers of clothing when going outside (or inside, if we’re going to be honest), to not have my shoulders hunched all the time to keep warm, and to be able to walk outside and actually enjoy it! 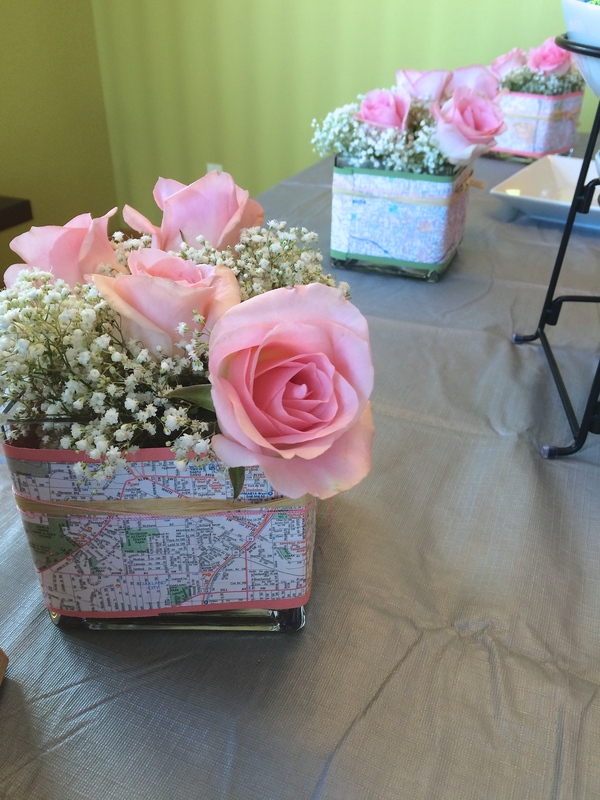 The sun was shining all weekend, the birds were chirping, and it was the perfect weekend to host a bridal shower! Which is exactly what I did. A dear friend of mine is getting married this spring and it was such a joy to be able to bless her with a shower. Back in the day, I loved crafting and scrapbooking, and I always got way too excited about school projects. Somehow, that hobby slowly slipped away (I blame college) and when I finally emerged from all the homework and studying, I started up a new hobby — cooking and baking (I also blame credit my schooling of dietetics on that switch). Long story short, it was so much fun to be able to combine both of those hobbies together for this shower! My friend’s wedding theme is “adventure”, so I matched the theme and set out to make the decorations with anything involving maps, stamps, and planes with the help of another close friend. I think it was a success! 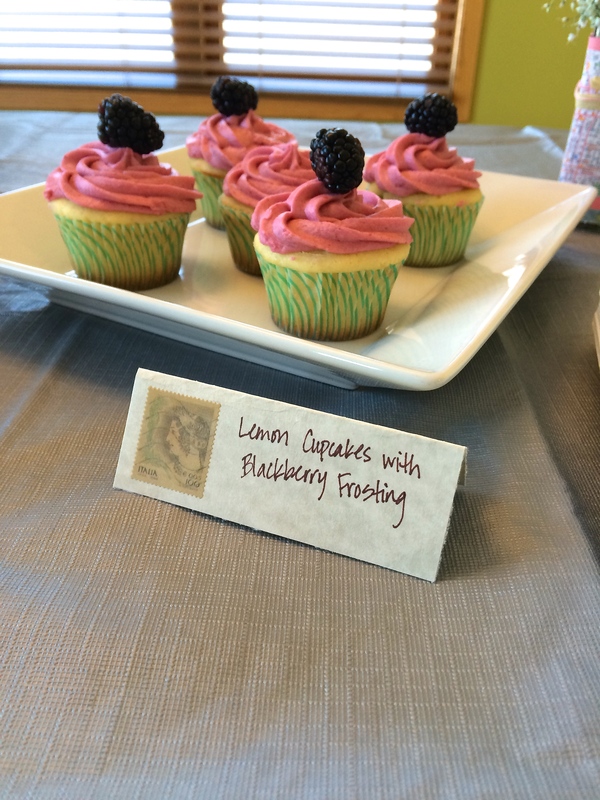 The decorations were fun to make, but I still felt “in my element” in the kitchen, whipping up one of the desserts for the shower — Lemon Cupcakes with Blackberry Frosting. The perfect flavor combination for a warm, almost-spring day. 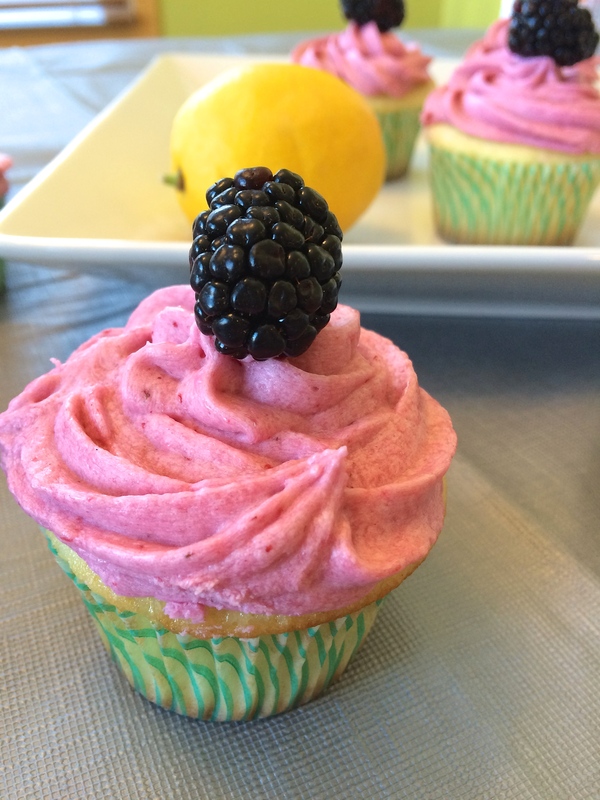 Although the process of making a true cake that’s moist with small air cells (and not out of the box) can be a little time consuming and making a frosting with pure blackberry puree adds a bit more time, the final outcome is well worth it. Plus, it helped knowing I was putting in the effort for my friend, who I knew would love the fresh fruit flavors. I feel part of the joy in cooking and baking is sharing your creations with others and seeing the enjoyment they get from eating them (hence, partly why this blog exists). All that to say, yes, this recipe has a few more steps to it (but not hard ones!) and it takes more time than using a boxed mix, but I highly recommend going for it (and not skipping out on any of the steps!). You won’t regret it. 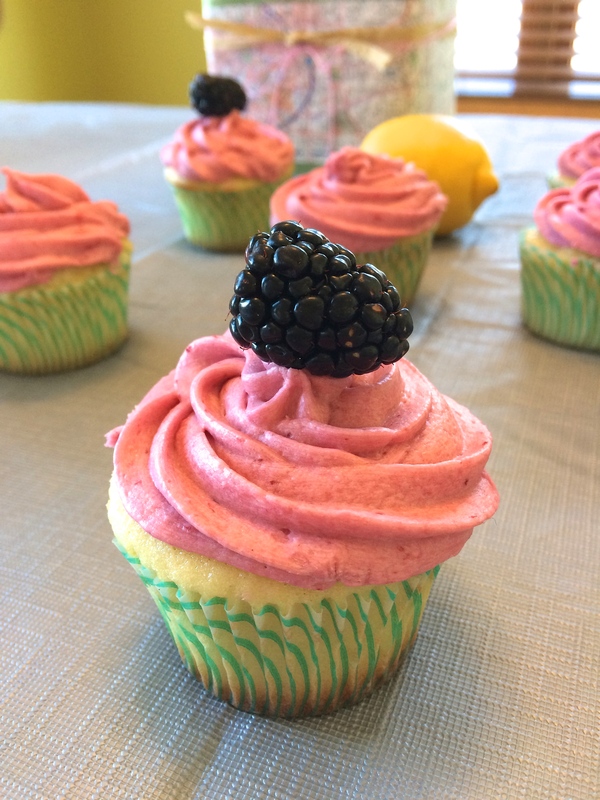 Whether you have a shower to plan, a birthday party coming up, or you’re just in the mood for some cupcakes, these are the perfect cupcakes to welcome in the new spring weather! *Instead of buttermilk, substitute by combining 1 1/4 cups milk with 1 Tbsp + 1 tsp vinegar; let sit for at least 5 minutes. To make the cupcakes, preheat oven to 350°. Line 2 cupcake tins with paper liners and set aside. In a medium bowl, combine the cake flour, baking powder and salt; whisk to combine. In the bowl of a stand mixer fitted with a paddle attachment, add the butter and lemon zest. Beat on medium-high speed for about 3 minutes, until light and fluffy. Scrape down the sides of bowl and beat for 1 more minute. Add the sugar to the butter mixture, 1/4 cup at a time, beating 1 minute after each addition. Mix in the eggs one at a time until incorporated. Scrape down the sides of the bowl after each addition. Combine the buttermilk, lemon extract, and vanilla extract in a liquid measuring cup. With the mixer on low speed, add the dry ingredients alternately with the wet ingredients, beginning and ending with the dry ingredients and mixing just until incorporated. Scrape down the sides of the bowl and mix for 15 seconds longer. 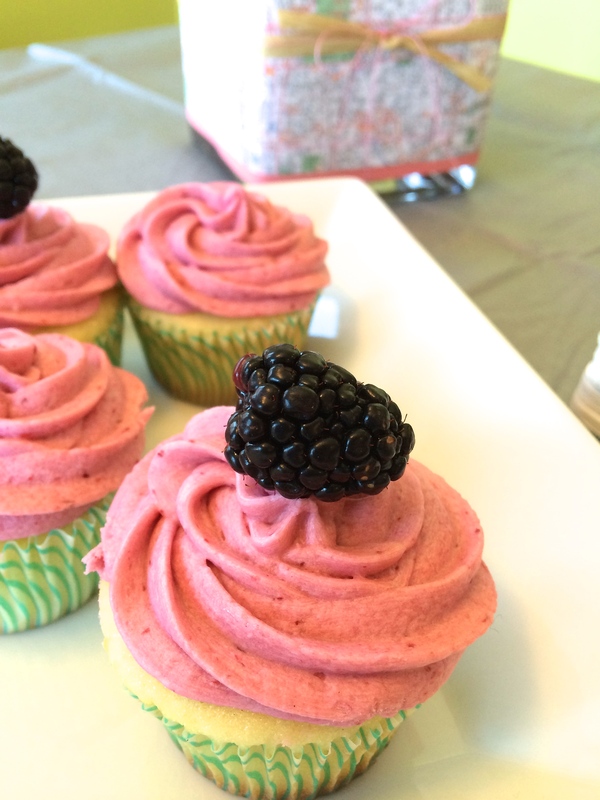 For the frosting, puree the blackberries in a food processor. Strain the pulp out into a fine-mesh strainer. Using a rubber spatula, push the blackberry pulp through the sieve to remove the seeds. Discard the seeds, and set the pureed blackberries aside. In a stand mixture, cream the butter over medium speed for 1 minute. Reduce speed to low, and carefully add in the confectioners sugar. Add the vanilla extract and the blackberry puree. Increase speed to medium, and beat until smooth and frosting is combined. Your photos are just great, I feel I was there. And I am like you, my favorite place in the house is the kitchen. Your recipe is one I definitely will try, Thanks for sharing. Thanks, Cecilia! It was such a fun day to capture in pictures (and the cupcakes were pretty fun to capture, too!). 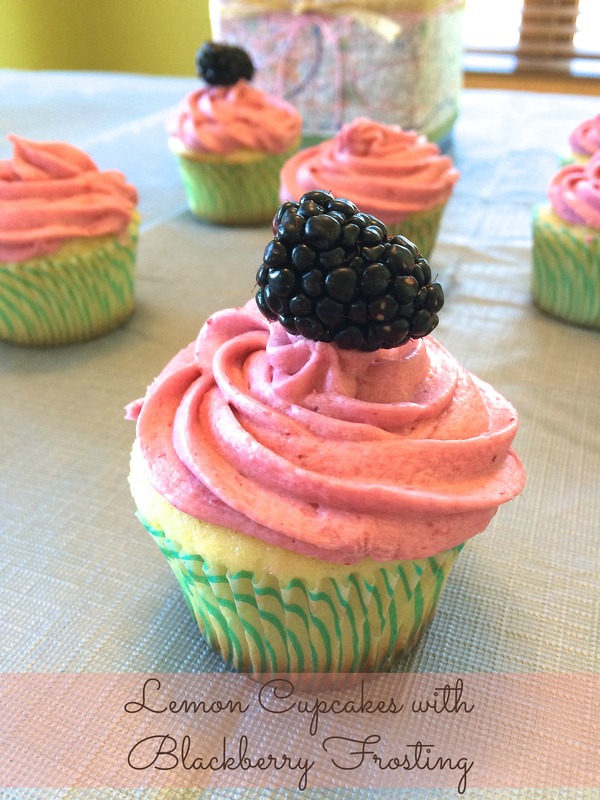 Let me know how you like the cupcakes when you give them a try! Such a cute theme, and I too am crossing my fingers that spring is here to stay! I love those decorations! 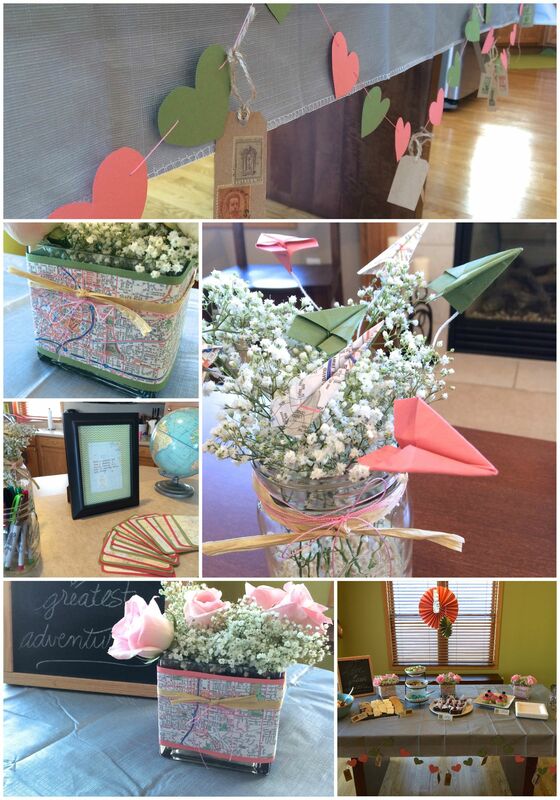 The paper airplanes are fantastic, and wrapping a strip of map around the flower vases is so cute. The cupcakes look delicious. I hope I have a chance to make some soon!